A common staple in so many diets, we use multiple varieties of lettuce in salads, sandwiches, and in cooking to add a boost of nutrition, crunch, color, and flavor. Lettuce is one of the most well-known vegetables available, but is it safe for dogs? In small amounts, yes, dogs can eat lettuce with no negative side-effects, but there are also better choices available. 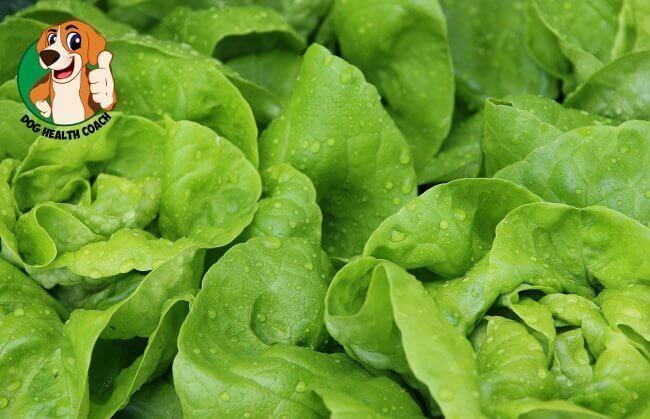 Most of us use iceberg lettuce when we’re making a salad, and while the crunch and refreshing nature of iceberg can taste great to us, especially when covered in our favorite salad dressing, it offers no real nutritional value. The same goes for dogs when they eat lettuce – they may enjoy the crunch, but since there is no real taste to it (and you shouldn’t be serving it with dressing to your dogs!! ), there isn’t much of a nutritional boost. How much lettuce for your dog? One benefit is that a small amount of lettuce can actually help your dog deal with constipation. It’s a fine line to consider, though, because too much lettuce can cause digestive issues, and even diarrhea for dogs. Lettuce is also very low in calories, so if your dog enjoys it, it can be a low-cal snack for them. This can be especially helpful if your dog struggles with any weight issues. If you’re looking to give your dog more leafy greens, try something like spinach or kale for an added nutritional boost. While iceberg lettuce won’t harm your dog, they also aren’t getting very much out of it. So, seek out alternatives before offering your dog greens of any kind – you always want to get the most nutritional benefits possible. Looking for more tasty vegetables your dog can enjoy, and you can feel good about giving them? Check out our posts on tomatoes, and cucumbers, and you can practically make your dog a salad of their own!